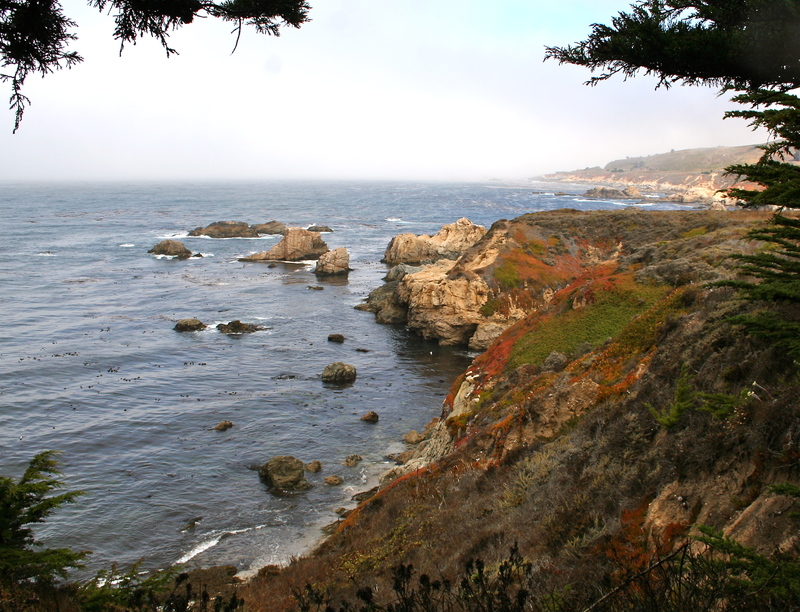 Carmel is only minutes away from the beautiful scenery of Big Sur. 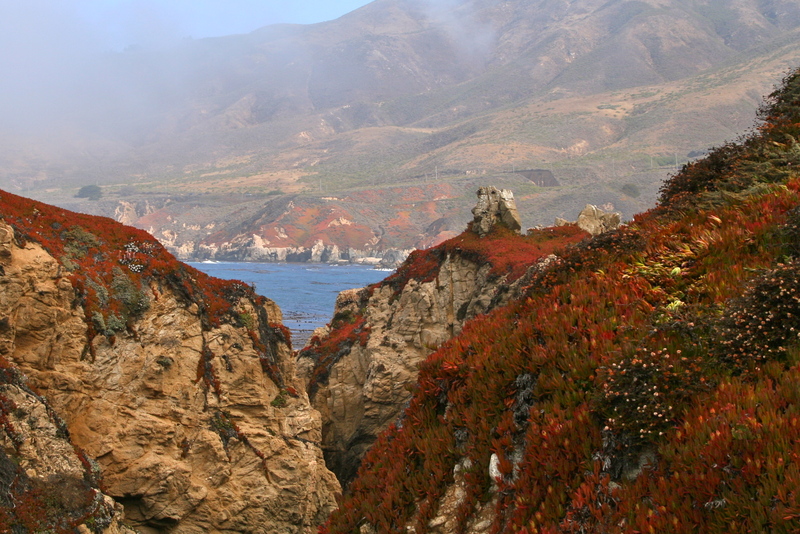 Big Sur is a 100 mile stretch of coastline along Highway One that begins just south of Carmel. One of my favorite spots is Garrapata State Park. This park is very poorly marked and the trail guide had warned me that the best marker was a small metal barn on the east side of the road just before the park. 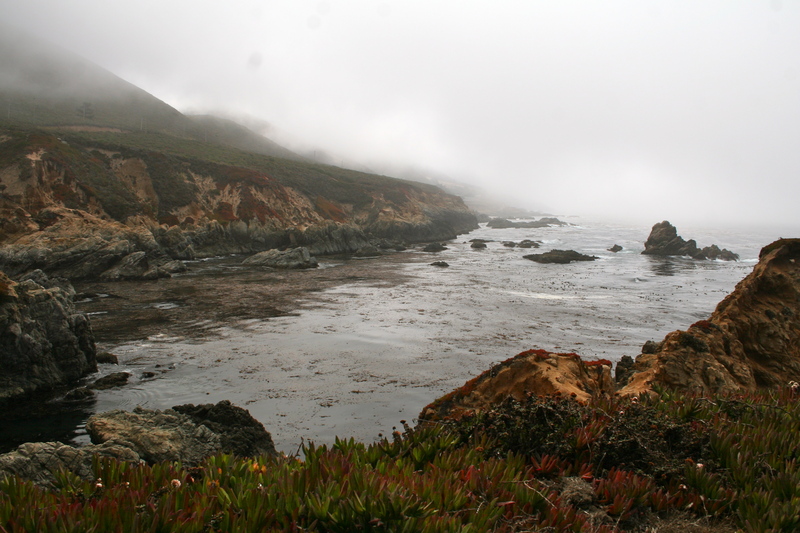 It is located on Highway 1, 6.7 miles south of Rio Road in Carmel (18 miles north of Big Sur). 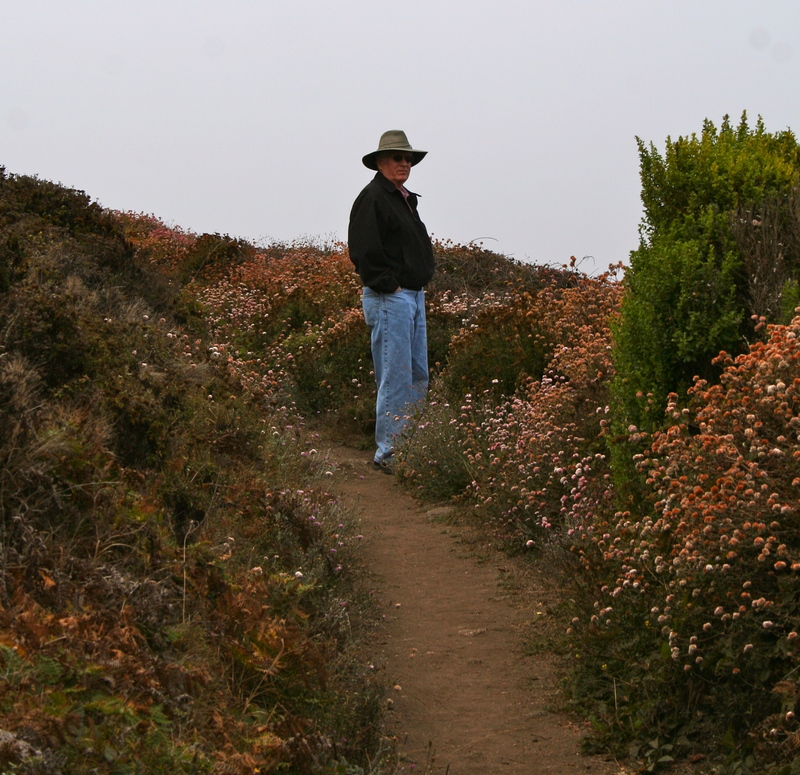 We took the gentle coastal path on the west side of the highway which allows you to make about a two mile loop along the outstanding coastal headlands at Soberanes Point. Park along the road and make your way down the path. When you enter the gate your first view is of the wildflowers and Whale’s Peak in front of you. 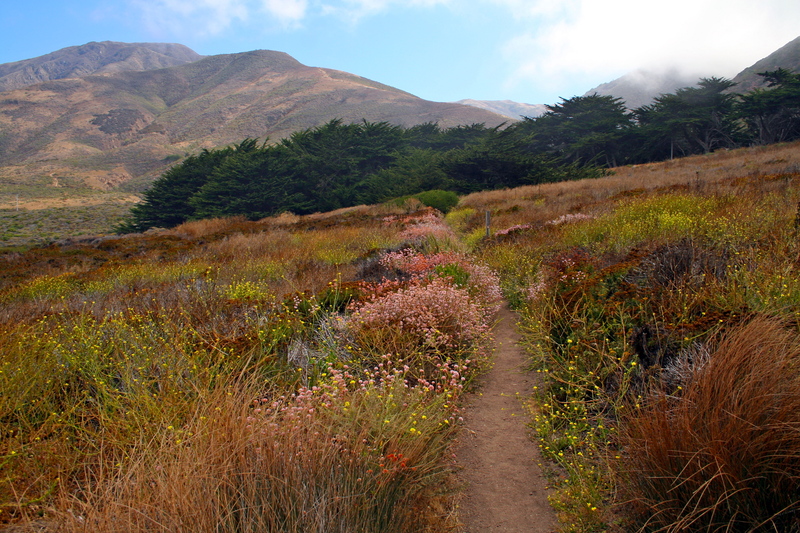 As you continue, the trail loops to the right and opens up to glorious views of the ocean. With every step a new vista appeared and I “oohed” and “aahed” and shot photo after photo. Sea lions, harbor seals and sea otters frequent the coastal waters and California gray whales pass close by during their yearly migration. But this day it was vegetation and wonderful rock formations that caught my eye. To make things even better, the fog started rolling it. 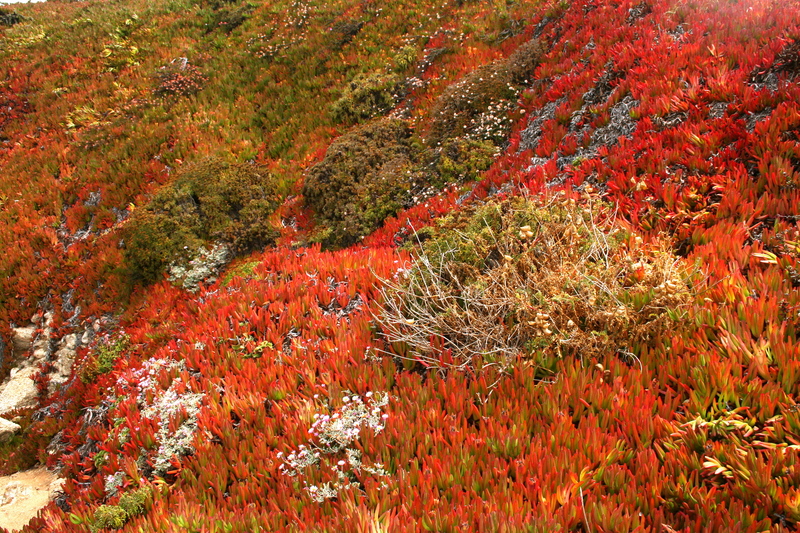 The red vegetation that catches your eye is ice plant. After the dry summer it turns this wonderful color. After the 20th or so photo, my husband who was leading the way realized that once more he had been duped into a photography session rather than the hike he so longed for. We quickened the pace. Still we were treated to views of the sea stacks rising out of the thickening fog. I would highly recommend this walk . Take your warm jacket. It is usually cool and windy along the coast. Unless otherwise stated, all photographs are copyright (c) Linda Hartong. All rights reserved. You may not use any image on this site without my written consent. If you are interested in using a photo from my website for any purpose, please send me a quick message and let me know which photo(s) you are interested in. This often happens to my husband too.. Thank you so much for sharing. As a land locked Oklahoman, I have always wanted to visit the California Coast, especially the area you are focusing on. It may be as close as I get in my lifetime. Glad the Taskmaster allowed you some time for these gorgeous shots! O Wow! Breathtaking…colors are amazing. So beautiful. Your blog got me out to Carmel for a visit last year. So sorry I missed this hike. I will have to come back. Great, unbelievable shots really liked the red ice plant! Unfortunately, the “ice plant” is a non-native species that is crowding out the native plants along our beautiful coast. The ice plant (Carpobrotus edulis, or hottentot fig) is native to South Africa and has become invasive, posing a serious ecological problem by lowering biodiversity, and competing directly with several endangered plant species for nutrients, water, light, and space. We should concentrate on the other plants in your informative photos, such as the coastal buckwheat, sticky monkey flowers and the seaside daisies that are valiantly poking their heads up through the ice plant. 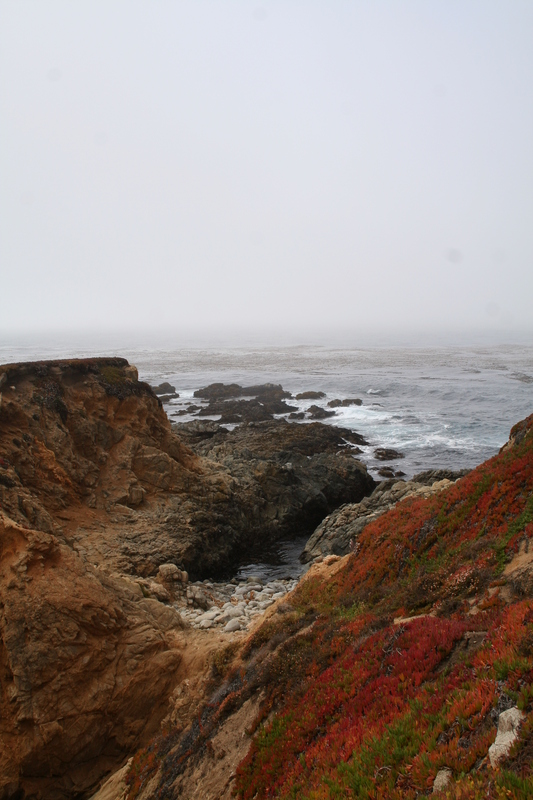 Friends of Garrapata (FOG) and the Point Lobos Foundation (PLF) are supporting the California State Parks with funds and volunteers to help keep our coastal trails natural.